Leaves that look like pointy-tippped lasagna, with tall seed stalks covered in seeds that turn brown and dry later in the year, having a slightly nutty flavor. The leaves have a light yellow or purple middle spine, different colored than the leaf. A very common but highly useful body purifying weed. Whole plant useable. Young leaves edible. Root is most medicinal. A non-irritating laxative for constipation. It calms the intestines and comforts inflammation of the intestinal lining. Tea enhances digestion and improves appetite. Used to detoxify the liver, clean the blood, bowel infections, treats peptic ulcers, invigorates the liver and colon with glycosides. Great for healing gout, urinary stones and bladder inflammation. Soothes respiratory system, helps body absorb nutrients, removes toxins through the urine. Contains Anthraquinones which stops ringworm and fungus. Used historically for sexual diseases like syphilis. Pulls toxins from the blood, lymph and body tissues, raises red blood cell count (more oxygen in your body) Relieves heavy menstrual periods, pain, fibroids and anemia. Rich in iron and even helps relieve depression, inflammation and swelling. Great for skin conditions and itching. Used for centuries for great results with skin conditions like eczema, psoriasis, rash, boils, abscesses. Helps remove sores, pimples and problems from the skin. Can be mixed with sage as a tea and consumed and also put in a bath. 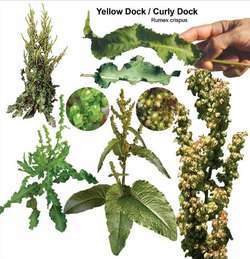 If you want to make a really good healing cleanser, mix Yellow dock with burdock, dandelion, and even some nettles. Now you’ve got some serious cleaning power ! Under the Wildlife and Countryside Act, you should not have either Japanese knotweed (Fallopia japonica) or giant hogweed (Heracleum mantegazzianum ) in your garden and, under the Weeds Act of 1959, there is a list of five invasive and noxious weeds that should not be allowed to grow, including the broad-leaved and curled docks (Rumex spp) and ragwort (Senecio jacobaea).